Home Mardi Gras 2018 around Australia! In the 40th year of the Sydney Gay & Lesbian Mardi Gras, JOY 94.9 and the Community Radio Network are again bringing stations and listeners all the fun of the annual parade live down Oxford Street. It's just one part of JOY 94.9's bumper four days of Mardi Gras parade weekend programming in collaboration with SBS Radio, and the CRN will also be distributing three extra specials for stations to play on demand: 21st Century Women, The Gender Agenda and Not My Cup Of Tea. Falling this year on Saturday 3 March, the parade will be hosted by Benjamin Norris, new host of JOY 94.9/CRN's Word for Word and the first out-and-proud winner of Big Brother Australia; Dean Arcuri, cabaret performer and executive producer of JOY’s nightly current affairs show The informer; and Dano and Mason, the hosts of Australia’s only lesbian drive radio show. The hosts will also cross to Melbourne comedy duo The Tag Team who will be roving up and down the street throughout the parade (pictured are some of the 2017 rovers!). Stations can join in and take listeners street-side for the historic 40th parade - all in the year following the passing of marriage equality legislation! Stations can join the broadcast for even a small window, incorporating it into local Saturday night party programming. Is your station joining us for the Parade? Let us know to give a shoutout to your listeners! 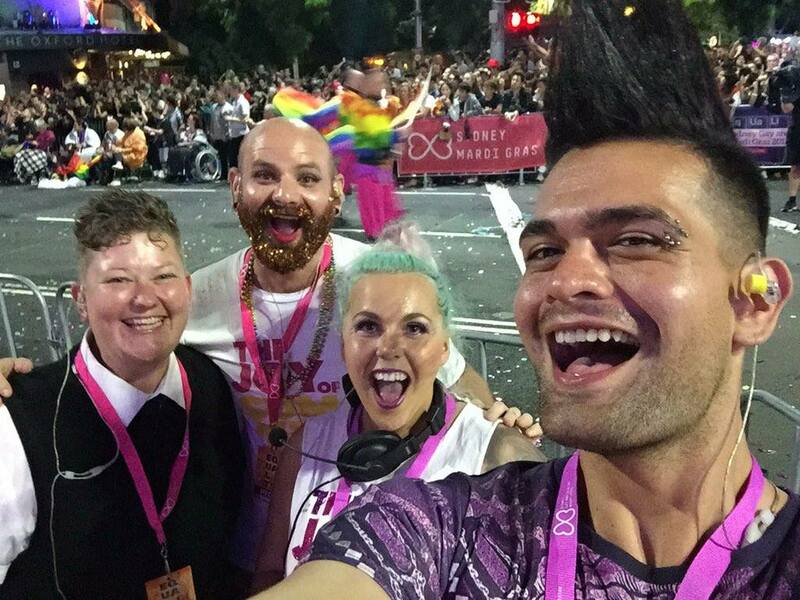 JOY94.9 and 2SER are presenting live coverage for the Community Radio Network from the 2015 Sydney Gay and Lesbian Mardi Gras Parade on Saturday 7 March.